Make your salads stand out with delicious dressing recipes containing no animal products. With a handful of vegan options for salad dressings on tap, you can jazz up your greens and enjoy new flavors. 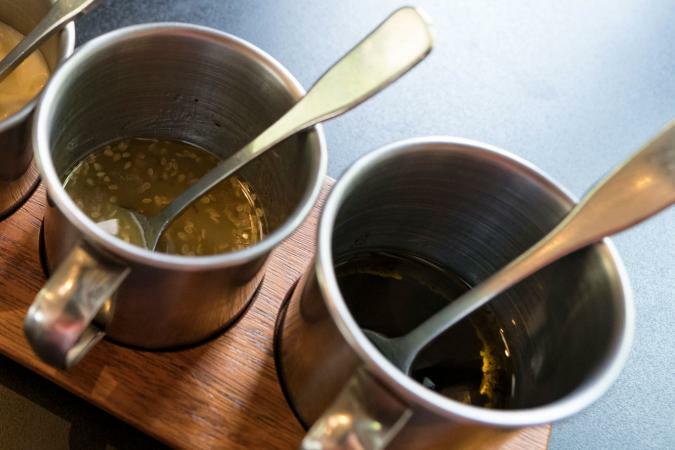 This vinaigrette is mildly sweet with lots of tasty Asian flavors and spice. Yields about 1 1/2 cups, which is 24 tablespoons, or about 12, two-tablespoon servings. Feel free to halve the recipe. This will keep tightly sealed in the fridge for up to a week. Try it drizzled over a kale and walnut salad or served as a dressing for coleslaw. In a blender or food processor, combine the pear, apple cider vinegar, ginger, garlic, sesame oil, sriracha and salt. Blend or process until smooth. Running the blender or processor, slowly drizzle in the olive oil until it is incorporated. 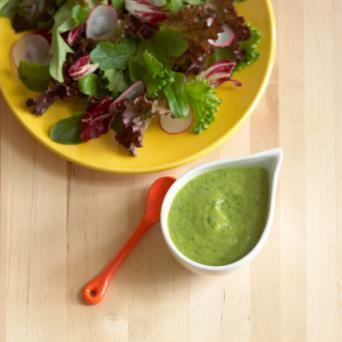 This herbal salad dressing is delicious on a typical tossed green salad or a bed of greens. Using fresh herbs is essential for adding flavor. 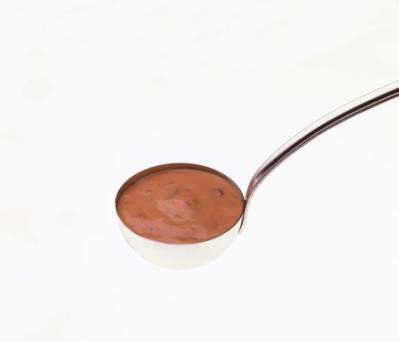 This yields about one cup, or eight, 2-tablespoon servings. It will keep in the fridge for two days, but when you store it, put it in a small bowl and place plastic wrap directly on the surface of the dressing to keep any air out. In a blender or food processor, squeeze the lemon juice over the chopped avocado. Add the lemon zest, milk, dill, chives, thyme, parsley, garlic, salt and pepper. This creamy red dressing is delicious on chopped salads. It has a slight kick, so if you like a little heat, you'll definitely enjoy this dressing. The recipe yields about 3/4 cup, or about six, 2-tablespoon servings. This dressing will store, tightly sealed, in the fridge for up to one week. Combine all ingredients in a bowl and whisk until smooth. You will find many other sources for vegan dressings, or you can easily modify recipes to make them vegan. This vinaigrette recipe contains no animal ingredients. You can change it by substituting other herbs for the oregano or adding a pinch of red pepper flakes for heat. Balsamic vinaigrette has no animal ingredients, and the dressing has a lovely sweetness and rich flavor from the balsamic vinegar. Two of these three healthy salad dressing recipes are vegan. In the Greek yogurt ranch dressing recipe, replace the Greek yogurt with plain vegan yogurt, such as soy yogurt, and replace the buttermilk with an equal amount of nondairy milk plus 1 teaspoon of lemon juice. This Japanese ginger salad dressing recipe has a lovely tang and is completely free of animal products. These dressings are delicious on salads, sure. However, they are equally good drizzled on roasted vegetables or as a dip for your favorite snacks. 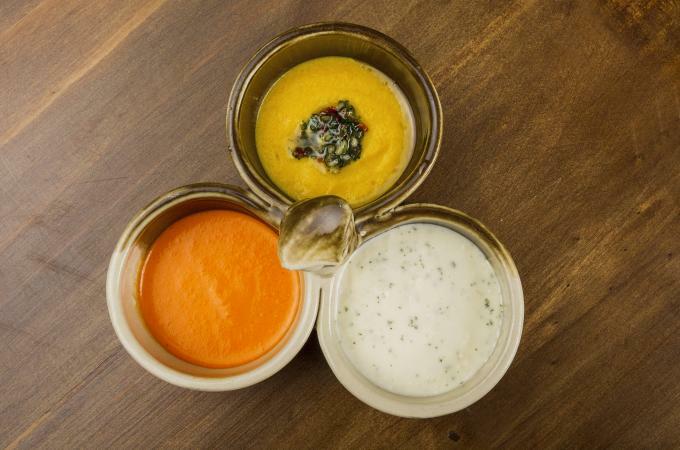 So whip up a batch of dressing to add extra flair to your vegan diet.